Virgin Balloon Flights was formed in 1994 after Sir Richard Branson’s record breaking flights across the Atlantic and Pacific Oceans in previous years. He handed the reigns over to chief pilot Kenneth Karlstrom in 2002, who flew Stephen Hawking in a balloon that same year. For more than 20 years, the company has continued to grow and has flown almost 1 million happy passengers since launch. As the largest commercial hot air balloon ride company in the world, they now fly from over over 140 launch sites 7 days a week, as well as having a sister company – Ballooning In Tuscany – where you can fly over beautiful Italian scenery. They have even hosted gigs at 5,000 feet by Newton Faulkner in 2008 and Beverly Knight in 2011. Virgin Balloon Flights continues to operate a number of packages across their range, you can even arrange to propose during a flight! How do I use my Virgin Balloon Flights voucher? Click ‘view basket’ and enter the promo code in the box beneath your order. Keep an eye on Virgin Balloon Flights' competition page for the chance to win some great prizes! When can I book Virgin Balloon Flights for? They schedule hot air balloon rides morning and evening, seven days a week during the UK ballooning season which is March to October. This does vary in some areas and in late October some flights will take place during the day due to limited day light hours. Where can I book Virgin Balloon Flights from? Are Virgin Balloon Flights suitable for those with additional needs? 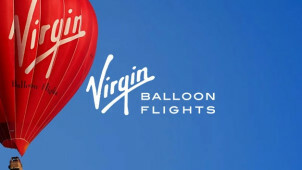 Please get in touch with Virgin Balloon Flights before you book, as they will be able to advise you. They make every effort to ensure people with disabilities have the opportunity to participate in balloon flights wherever it is possible and safe to do so. Information can be provided about disabled facilities at specific launch sites on request. Unfortunately, for safety reasons, they are unable to fly anyone who requires a wheelchair. See the delivery details page online for full details. You can cancel a flight up to seven days before online and up to three working days before by post or email. After these times you will need to attend the flight unless there are extenuating circumstances, such as a medical matter for which we may require documentation may be required. If your flight is cancelled because of the weather or related factors, you can just book onto another date. Plus if you have a cancellation near the end of your voucher validity period, Virgin Balloon Flights will extend it free of charge so you have another six months in which to book again. There is also the option of a weather refund if you book a 7 Day Anytime Plus flight voucher (which comes with the Luxury Gift Package). I am not what you would call a typical balloonist, in the sense that I am not an explorer from the 19th century, nor much of a thrill seeker in general. So when the opportunity arose to go up with Virgin courtesy of vouchercloud, I decided to go for it with a certain amount of trepidation. Would the balloon be safe? How long would we be up there for? Would there be a buffet car? The answers to my questions were a. yes, b. about an hour and c. no. But what an experience! As a confirmed balloon-sceptic, I have to say I loved it. Under the expert tutelage of our pilot Mark (“call me Nobby - everyone does”) we undergo a quick safety briefing and jump into the basket for take-off. I find myself an instant convert to the balloon life as we soar through the skies of Bristol. Over Ashton Court, the harbour and further east over Brislington and Keynsham, the views are as breathtaking as you’d hope for. It’s completely calm too, the stillness of the balloon a strange contrast to the odd fact that we’re in a basket floating 2000 feet above the ground at 12 mph. It’s blissfully serene up here, and on this clear afternoon we can see out to South Wales across the bay. After about an hour in the air it’s time to land and, with some expert manoeuvering from Nobby, we set down in a field in Warmley before packing away the balloon and enjoying a glass of champagne. I would recommend this experience without hesitation to anyone, whether you’re the adventurous type or if, like me, you’re more of a ground-level kind of person. In the safe hands of Nobby and his team, Virgin Balloon Flights offers an unforgettable experience. Are you looking for a gift that truly flies above the rest? Well look no more! Virgin Balloon Flights offer breathtaking hot air balloon rides that allow you to experience this unique, serene yet exciting mode of travel. A Virgin Balloon Flights voucher means your gift could come to a lot less than you’d expect. With over 140 launch sites around the UK and many different gift packages available, an experience from Virgin Balloon Flights is not one you’ll forget. The highly trained balloon pilots will be your guide throughout your experience. After your registration, you will receive a full briefing including safety instructions from the pilot as well as the invitation to help with the inflation and deflation of the balloon. At the end of your flight the pilot will sign your certificate that you can keep as a memento of your amazing day. You will then be taken back to your original launch site! The Gift Packages at Virgin Balloon Flights are a great present for any occasion. A Virgin Balloon Flights discount code could make the experience even better value. Bespoke packages are available featuring gift hampers, champagne, an invitation box and a certificate signed by your pilot and endorsed by Sir Richard Branson. Rides are available for 1 or 2 people or even a whole group. There are packages for all budgets and tastes do don’t delay and get yours now!